Swirling and uptempo, SkyHigh celebrates and explores the unbounded, joy-filled music of heaven. 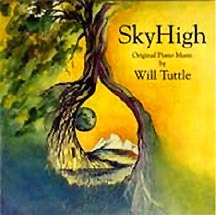 The third in Will Tuttle's Call trilogy of original solo piano music, SkyHigh is rousing and yet easy to listen to, with vibrant cover art, shimmering melodies, and lots of variety infusing his characteristically flowing style. 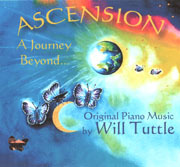 The album displays an intricate inner consistency in which the first three pieces palpably lift the listener skyward, the fourth establishes this celestial arrival, the next five pieces explore uplifting aspects of the inner skyscape, and the last two allow both return and further exploration into the endless vistas of being. Click here to go to CDBaby to download this album now for $9.50, or individual tracks for .95. You can also hear samples of all tracks here as well. Also available on iTunes, GooglePlay, etc. with large file sizes indicated for hi-speed connections. 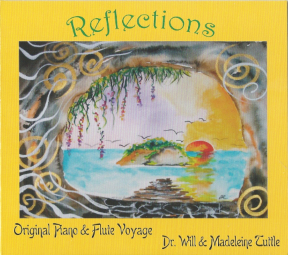 Reflections - Relaxing and meditative piano & flute voyage. 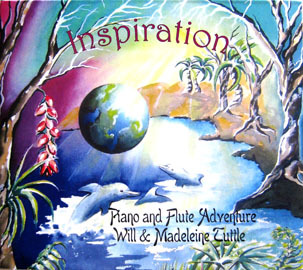 Inspiration- a piano & flute adventure by Will & Madeleing -- for journeying, inspiration, & relaxaion. An enhanced CD with 25 of Madeleine's paintings also. Ascension - A Journey Beyond. Piano music of immense power, joy, and inspiration. Islands of Light - an enhanced CD multimedia adventure with 18 pieces (64 minutes) of uplifting and relaxing original piano music. AnimalSongs - soothing and soaring piano blended with animal voices and nature sounds. The Call - a musical journey with rich, complex harmonies. World Peace Meditations - a spoken word meditation album with 8 healing meditations for awakening plus bonus World Peace Diet track. Four Viharas - a spoken word meditation album on the ancient practice of cultivating Love, Compassion, Joy, and Peace.